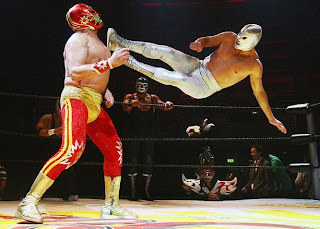 This is your rad, raw primer on Lucha Libre fighting in Tijuana, Mexico, following current heros of the sport, the up-and-comers, the officials, the promoters, the die-hard fans, the ritual and the spectacle. Film directed and produced by UCSC film professor Gustavo Vasquez. BRING blankets, pillows, anything you need to be comfortable in the great outdoors, (we will be in the courtyard. A few chairs will be available, but you might want your own) friends, and snacks to share. Donations to support the project are more than welcome. **Santa Cruz Guerilla Drive-In is excited to partner with the Felix Kulpa Gallery and Streetlight Records. We have one more show with them. Save the date: Let the Right One In will be on October 25 (the last Friday of the month).